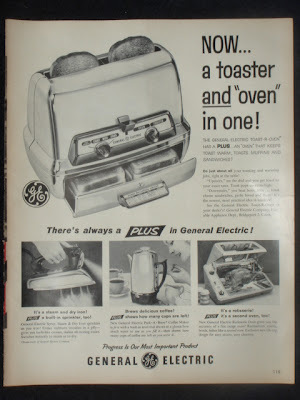 Vintage GE 25T83 Toaster ~ The History Girl! This past weekend my boyfriend and I discovered this awesome Vintage General Electric Toaster in the attic. I love vintage kitchen pieces but unfortunately we do not have enough space to keep everything we find! Vintage General Electric 25T83 Toaster in chrome. It has brown bakelite handles, two slots for toast and a bottom drawer for oven use. The toaster oven has settings for oven or toaster and it also has three heat settings for oven warming: light, medium and dark. The bottom drawer handle has an oven toaster chart on it to help you choose the best settings for pastries or toast! This has not been tested but worked when last used about 15 years ago. Has been in storage since. This toaster has been SOLD! Thanks for looking! 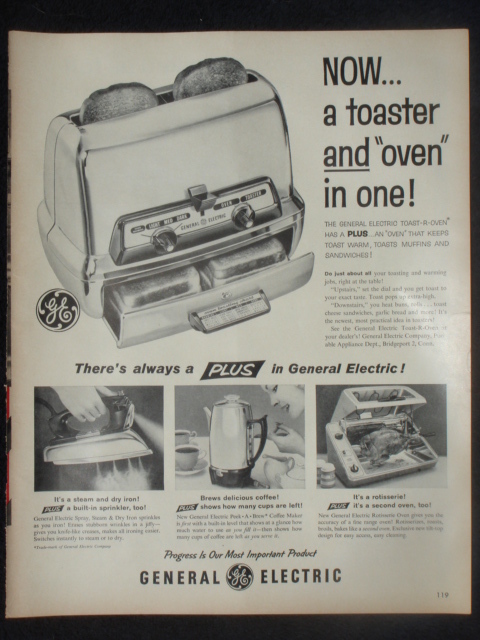 1957 Ad for this Toaster. I love old appliances. Thanks for sharing the photo of such a beauty! That toaster looks to be in very good condition too. Super cool! I love vintage finds and this one is definitely a great one! Also, thank you for your support yesterday! That is SO neat! I love that it's got the chart and the neat settings on the front. Wouldn't be able to part with it if it was mine! 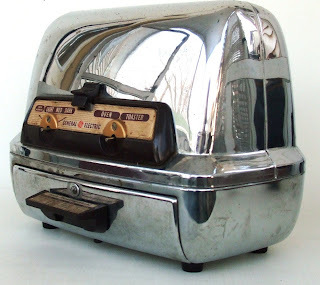 My parents recieved one of these in 1959 as a wedding present, so I remember growing up with a this different toaster. I will acquire one soon as every time I see one online, I just want to touch one again and hear the sound it makes when it pops up. I believe there is some cool repressed memory that this will spark. For those Mad Men fans out there, this is the very same model Don & Betty Draper have in their kitchen - very nice example of a classic chrome toaster! Would you mind telling me how much you got for it? We just picked one up at a garage sale.